The growing popularity of methamphetamine over the past 15 years has increased the risk of exposure to the surrounding community and law enforcements personnel. Methamphetamine is a controlled substance that is “cooked” using many common household ingredients which can be volatile and generates by‐products that can be very harmful to humans. When these products are combined, they emit toxic fumes and may cause chemical burns upon contact. Toxic residue from the cooking process saturates every surface and can remain there for months or years if not properly sterilized. Since the chemicals can be inhaled, ingested, or absorbed through the skin, everyone coming in contact with those surfaces is vulnerable. Acute exposure occurs over a relatively short time and produces symptoms that include: shortness of breath, cough, chest pain, dizziness, lack of coordination, chemical irritation, and burns to the skin, eyes, nose, or mouth. If toxicity levels are fairly high or a person is particularly vulnerable (i.e. pre‐existing breathing problems), acute exposure can cause death. Less significant exposure can result in headaches, nausea, dizziness, fatigue, or lethargy, and can lead to other long‐term health problems. 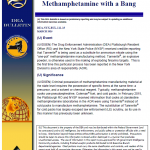 The purpose of this assessment is to assist members of the law enforcement and public safety communities in differentiating among four types of clandestine laboratories: biological, chemical, explosives, and methamphetamine. It provides descriptions, distinguishing features, and hazards of each type of laboratory and includes four reference guides for distribution to public safety personnel. 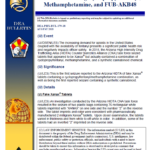 This assessment expands on a related product—Distinguishing a Biological Agent Production Laboratory from a Methamphetamine Laboratory, Lawrence Livermore National Laboratory, 22 January 2008—by including indicators and warning signs associated with clandestine chemical and explosives laboratories. * 86% Increase over the Same Period in 2008. In November 2008, two special education teachers in South Bend, Indiana were arrested after a meth lab exploded in their home and caused a fire. According to law enforcement statistics, in 2008 the state of Indiana had a 31% increase in methamphetamine lab seizures since 2007. Recent disruption of meth “super labs” in Mexico may have opened up the market to smaller producers throughout the nation to supply demand for the drug.